Have you ever noticed a tiny hole on the top front part of someone’s ear? This is referred to as an ‘ear pit’ and it is a congenital malformation, a preauricular sinus which appears when a person’s face comes together at the top. It is considered a slight birth defect. It was first discovered by Van Heusinger in 1864. Around 0.1-0.9% of the people in Europe and the USA are born with it. What is the cause of ear pit? The evolutionary biologist, Neil Shubin, said that such holes come from our ancestors. They might have been underwater dwellers, thus the holes might be remnants of fish gills, an only small percent of people have them. The ear pit is located around the external part of the ear and this condition can be passed down through generations and can sometimes become infected or even form a cyst. In order to remove the infection, the sinus is dried and removed sometimes. Around 2.5% of Taiwanese people and almost 10% of certain African regions have it. This number is significantly smaller in Europe and America. 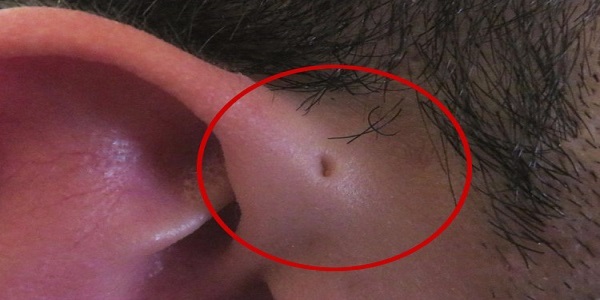 According to some researches, these holes appear on the tight ear, but can appear on both of them, sometimes. Some even compared these holes to being a mermaid.